As the saying goes, another month, another death metal release from the ineffable Rogga Johansson. This release comes in the form of Humanity Delete, which was founded back towards the turn of the century but was buried for a bit as Johansson focused on Ribspreader (and 50 other projects inevitably). 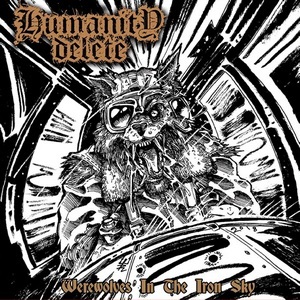 Nonetheless, after a 2012 resurrection, Werewolves in the Iron Sky marks the third output for this old school death metal act. There’s basically zero surprise when it comes to what Humanity Delete sounds like. Just a hit of the play button and a few seconds of material is going to allow it all to sink in. This groovy, mid-tempo and above experience is the thing that Johansson simply lavishes in. There’s a reason that this sounds so, so much like Johansson and that’s because he is responsible for everything on the album. 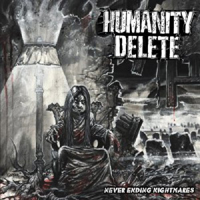 Whereas many of his projects have him teaming up with one, or a few people, Humanity Delete is all Rogga all the time. But that’s the kicker in all of this: if you enjoy what the man does, there’s nothing to be disappointed by over the course of the release. It hits hard, it provides plenty of surprisingly catchy riffs, and his vocals are as menacing as ever. While some of the tracks may start to feel a bit formulaic by the end, there’s little doubt that death metal fans will regret giving it a few more spins due to the energy factor behind it all. While Werewolves in the Iron Sky may feel like the same ole, same ole from death metal’s most prolific artist, it’s not a bad thing either. You know you are in for some quality, engaging material when Johansson is at the helm and it never disappoints. Particularly if you want some energetic death metal grooves.